Blocks of rooms have been reserved for conference participants at the following hotels. For more information about rates and bookings, please consult the sections below. Les Suites Hotel is located not too far from the conference: It is only a short walk (about 6 minutes) to the Shaw Centre. Each suite features a fully equipped kitchen, 2 TV’s with HD channels, ensuite washer and dryer, private balcony, and separate living and sleeping areas. The 700 sq. ft. luxuriously appointed Premiere One-Bedroom Suite features modern décor, soothing warm colours, beautiful dark woods, plush duvets, pillow-top mattresses, and upgraded bathroom products. The 1000 sq. ft. Premiere Two-Bedroom Suite features all the luxurious amenities of the Premiere One-Bedroom Suite, with the added convenience of a second bedroom and (most of the time) a second bathroom. If you require a second bathroom, please let them know when you book your reservation and they will do their best to accommodate your request. 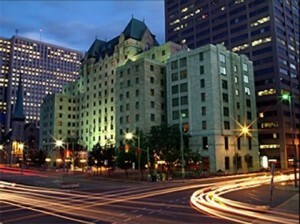 The Novotel Ottawa hotel is ideally located in downtown Ottawa in the heart of the Nation’s Capital. It is only a short walk (about 4 minutes) to the Shaw Centre. 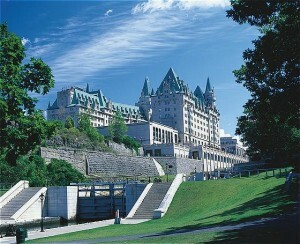 One of the finer Ottawa hotels, it offers its clients a warm, cozy and intimate accommodation experience. 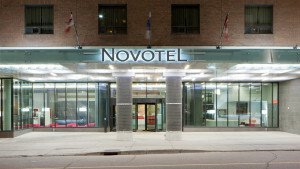 Novotel Ottawa Hotel specializes in personalized, friendly services in a quiet stress free environment. You will find their staff attentive, with no reservations to listen to the needs of the modern traveller. Their Ottawa hotel’s peaceful and serene ambience awaits you in any one of their contemporary decorated guestrooms. Reflecting the confidence, dignity and style of Canada’s capital city, Fairmont Château Laurier stands as a testament to this dynamic, thriving city. Located next door to the Parliament Buildings, the landmark Fairmont Château Laurier four star hotel is a magnificent limestone edifice with turrets and masonry reminiscent of a French château. It is only a short walk (about 10 minutes) to the Shaw Centre. This luxury downtown Ottawa hotel located near the exciting Byward Market and Parliament Hill enchants guests with its charm and stateliness. Note: There isn’t unfortunately a block of rooms reserved with the Chateau Laurier, so conference participants are encouraged to book directly with the hotel for the best available rate of the day. 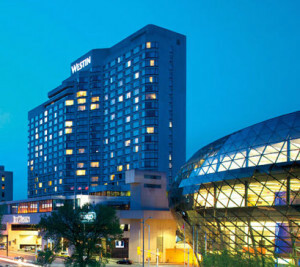 Located on the Rideau Canal adjacent to Rideau Centre Shopping Mall and the Shaw Centre, The Westin Ottawa offers direct access to all the allures of Canada’s capital city, from its thriving businesses to its many cultural diversions. There is an indoor pedestrian cross-way to the Shaw Centre. Refreshing and bright, the 496 guest rooms and suites bring modern design and technology to your fingertips. Contemporary furnishings, environmentally friendly features, and stunning views create a space that leaves you feeling instantly soothed. Rates do not include applicable provincial and local taxes, currently, 13% and 3% Destination Marketing Fee (DMF). No automatic or mandatory charges are tips, gratuities, or services charges for employees, unless otherwise expressly stated. Taxes and fees are subject to change. Rates are non-commissionable. Early Departure Fee: An early departure fee of $100 will apply if a customer checks out prior to the checkout date confirmed upon check in. Guests can access preferred rates site to learn more about the event and to book, modify, or cancel a reservation from January 11 to September 12, 2016. 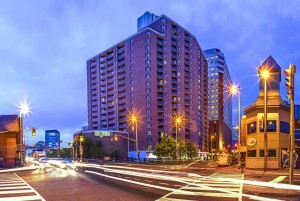 Ideally located in the heart of downtown Ottawa, overlooking Confederation Park and the National Arts centre. Lord Elgin is steps away from the Parliament Buildings, the Rideau Centre, and the Rideau Canal – a beautiful waterway in the summer and the world’s longest skating rink in the winter. It is only a short walk (about 10-15 minutes) to the Shaw Centre. Rates are NET and non-commissionable and quoted in Canadian Funds. In addition to the quoted room rate, all guests are required to pay 13% Harmonized Sales Tax and 3% Destination Marketing Program fee and any other applicable fees or charges. Delegates have the option to cancel up to three days prior to arrival without penalty.